I am including this as part of my Transformers: Age of Extinction reviews since the molds are all AOE. 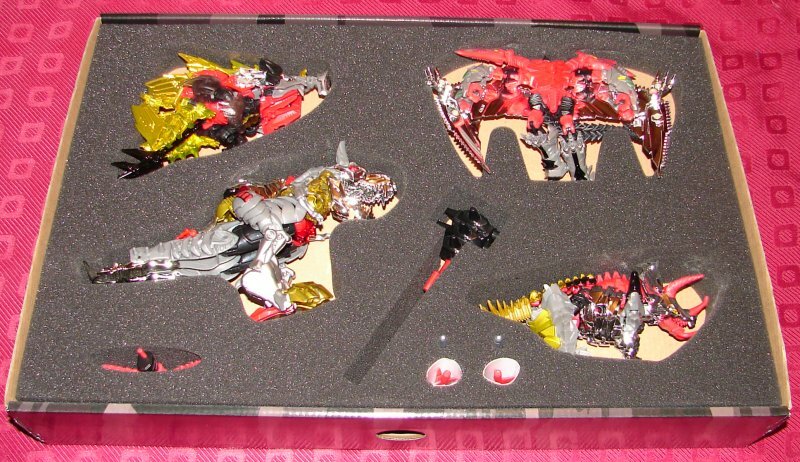 I have links below to the reviews of each mold, accept for Snarl, who doesn’t have a regular release yet. I will add that link when I have one. Above are the official pictures of the ark Mine came broken. It’s not terrible, one small break in the cardboard that you can’t even see. I just put a piece of tape on it and it’s fine. I don’t really have a good place to take a picture of it. It really is enormous. It feels a bit flimsier than I had expected. I’m not sure it can take the weight of the toys shown in the picture of a Voyager and Deluxe on the upper level. Hard to tell though, I didn’t want to risk it. Could just be because mine is broken. 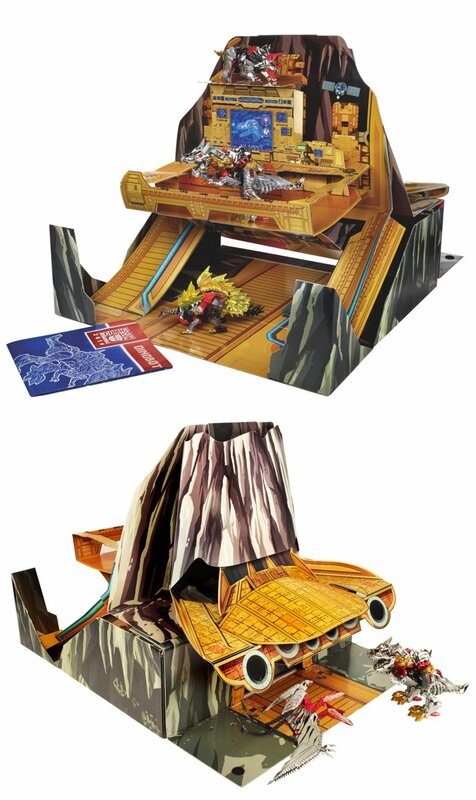 While it looks really nice, I’ve never understood why Hasbro has never done an Ark/Volcano play set, a real plastic one with action features. Back in the G1 days, all the other big toy lines had a play set. Even if it was limited to Hasbro Toys Shop, they would sell a ton of them. This isn’t bad though, and it’s likely the best we’ll ever get. Click here for my review of this mold. The picture doesn’t do his dinosaur mode justice. His head is silver chrome as is much of his back that looks kind of bronze in the picture. If you look at his neck, you can see a translucent greenish plastic, just like the G1. They made the shaft of his club red like his G1 sword. 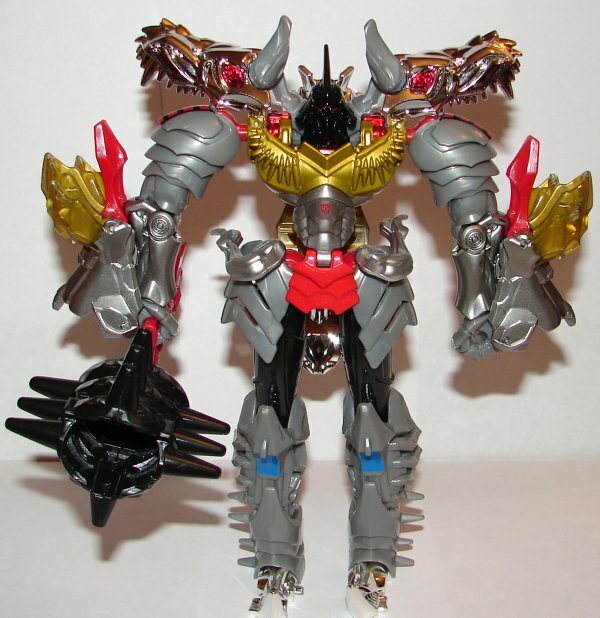 In robot mode they gave him the gold chest, red waist, and gray arms and legs, a very good G1 repainting of this toy. The one thing I would have liked were some G1 style weapons, but I suppose that would have been asking too much. 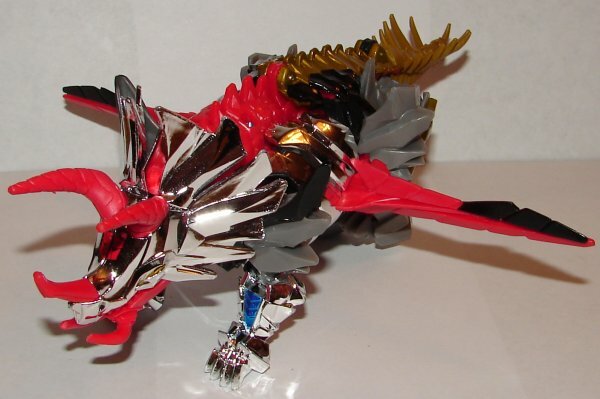 As with Grimlock, some of his silver chrome looks bronze in the picture. 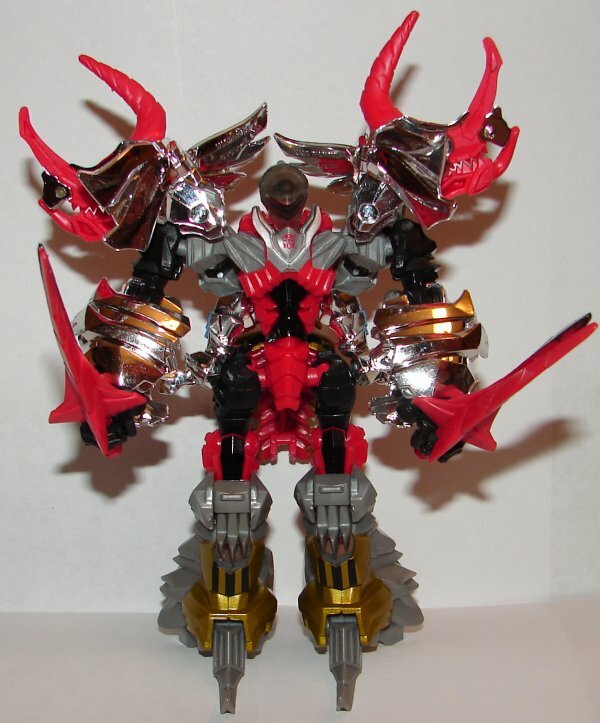 His entire dinosaur head is silver chrome, as are the sides of his body. 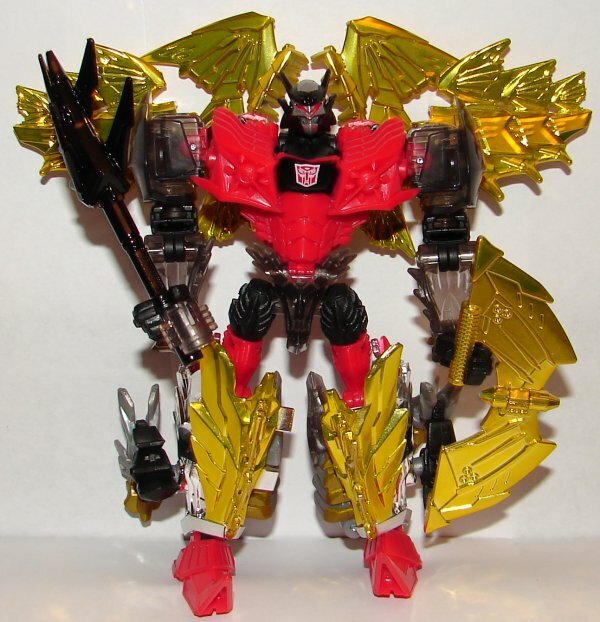 He has the red horns, though a lot more of them than G1 Slag. 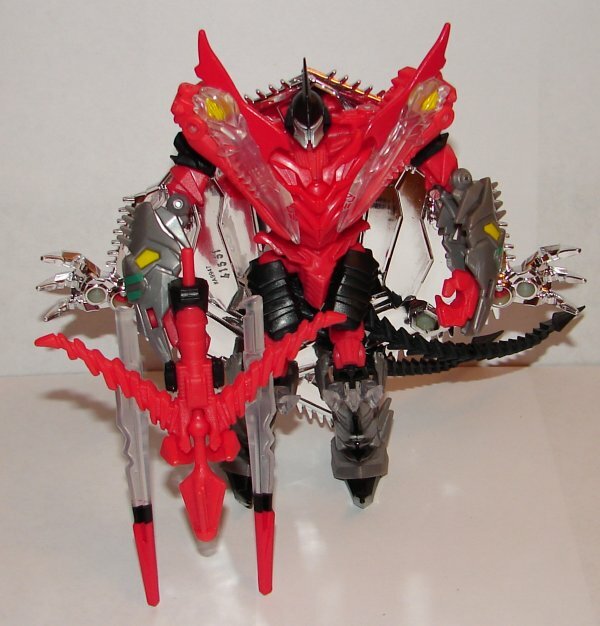 In robot mode he has the same red chest. Considering how much larger his wings are than the G1, he’s got a whole lot more silver chrome on them. A really nice touch is the translucent top half of his dinosaur heads, just like the original had (only doubled). 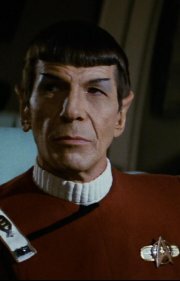 They did his robot chest in red. This is probably my second favorite. Oh my god he’s awesome! Snarl is by far my favorite in the set. He’s got tons of gold chrome all over him. In dinosaur mode he has a lot in common with the G1. 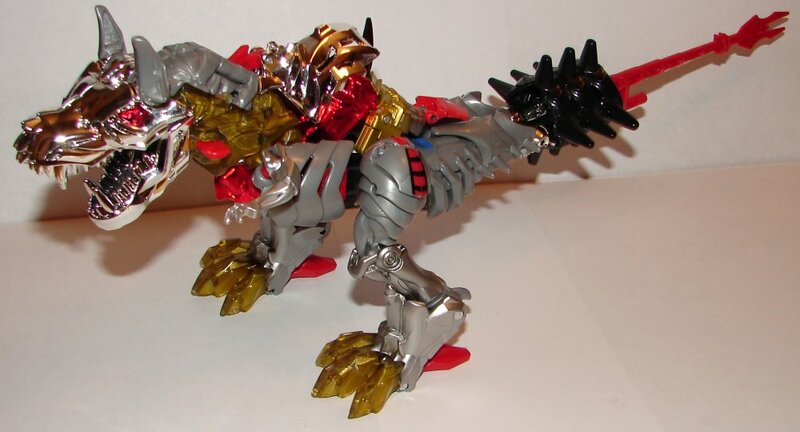 He’s got the gold feet, translucent gray plastic on his back legs, and most obviously the gold chrome plates. I really like his dinosaur head sculpt. 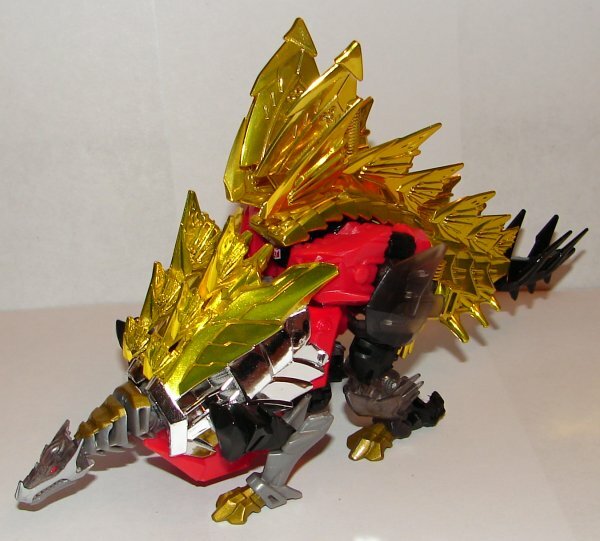 In robot mode he’s got the red chest, gold on his legs, and the spikes on each side of his back. He looks awesome, a million times better than the horribly colored regular version that still isn’t out yet. Overall: This set is a must for any G1 fan. Even if you don’t love all the new molds, in G1 colors they really do look sharp. 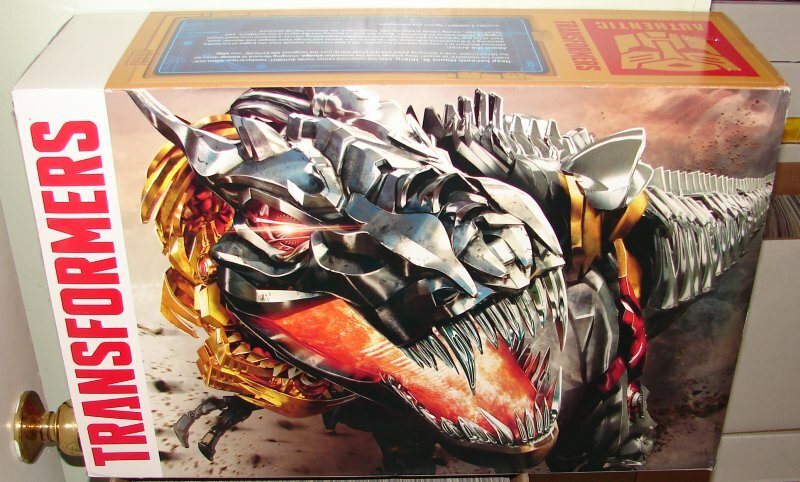 This entry was posted in Toy Reviews, Toys, Transformers and tagged Dinobots, Grimlock, San Diego Comic Con, SDCC, SDCC 2014, Slag, Slug, Snarl, Strafe, Swoop, Teletran One, The Ark, Toys, Transformers. Bookmark the permalink. I think the Kreons would be a little small. However, the upcoming transforming Kre-O building sets might be just about the right size.